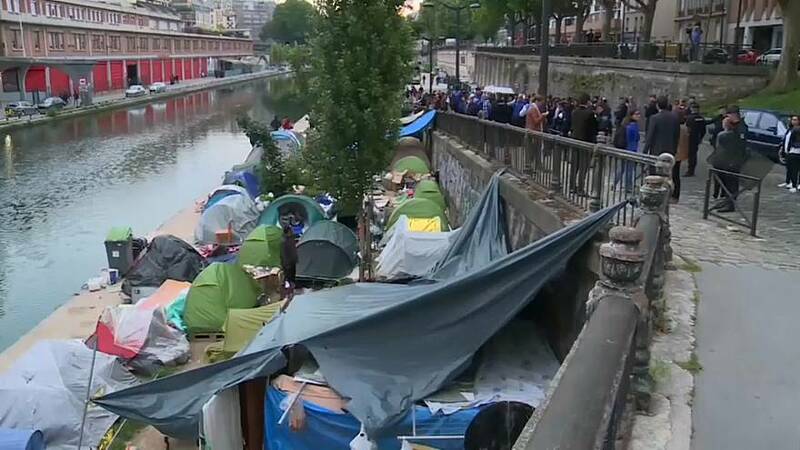 Around 550 migrants, mostly Afghans but some Africans, were vacated from a makeshift tent encampment along Paris' trendy Canal St Martin on Monday morning. The majority of tent-dwellers were single men but there were a few couples amongst them. All of them were escorted to buses without incident. Paris' Deputy Mayor for Emergency Housing Ian Brossat, who was at the scene on Monday, said the French state should take steps to ensure that no further migrant camps are established. French Interior Minister Gerard Collomb is behind a tough immigration bill that has escalated criticism of French President Emmanuel Macron, who wants to stop migration at its source and adopt a harsher policing approach at home. Climate activists blocked hundreds of employees from entering the headquarters of French bank Societe Generale, state-run utility EDF and oil giant Total on Friday (April 19).